Goals late in each half consigned 10-man Wales to defeat in their opening 2014 World Cup qualifier in Cardiff. Wales defender James Collins was sent off after 26 minutes for a lunge on Guillaume Gillet, and Belgium enjoyed almost total dominance thereafter. 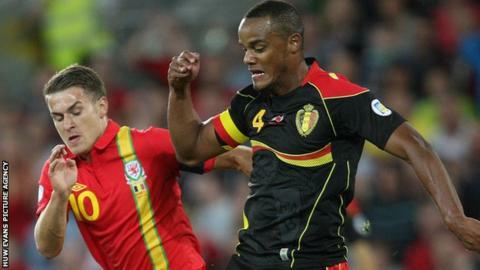 Vincent Kompany's front-post header from a Dries Mertens corner gave the Group A favourites a deserved lead. Gareth Bale was denied an equaliser by a superb save but Jan Vertonghen's late free-kick wrapped up victory. Tottenham left-back Vertonghen and Manchester City centre-back Kompany were two of Belgium's seven Premier League contingent that started, and the visitors showed plenty of poise and power to dispatch a limited Wales without much difficulty. It leaves Wales manager Chris Coleman still searching for his first win and first goal since taking over, but his side were left a near impossible task once Collins saw red. Having already been consigned to the role of firm underdogs, Wales were on the back foot even before the first whistle following the loss of Joe Allen. Illness deprived Coleman of his most accomplished passer, forcing centre-back Ashley Williams to leave his comfort zone in defence for a holding midfield role. That left a back four which, although all nurtured at Cardiff City, had never before played alongside each other. But their night as a defensive unit lasted only 26 minutes before Collins was sent off in controversial circumstances. Until then, Wales had acquitted themselves well in the face of Belgium's obvious superiority in possession, and even threatened as David Edwards found the side netting after 10 minutes. Collins, returning to the side for the first time in 18 months, had made a crucial intervention in his own six-yard box to deny Thomas Vermaelen, but moments later the West Ham defender stared in disbelief at his red card. Both he and right-back Gillet left the ground with studs showing as they lunged for a loose ball in midfield, but the Welshman was marginally late and caught the Belgian's ankle. Wales re-organised well as Williams slotted back from midfield, but the home side's resistance was broken three minutes before half-time. The outstanding Mertens, who had already fired inches wide, whipped a vicious corner towards the Wales front post and Kompany used his strength to resist Darcy Blake's challenge to head past Boaz Myhill. While Belgium had looked more than capable against 11 men, their numerical advantage almost turned the game into a training exercise. Mertens, Vertonghen, Axel Witsel and substitute Romelu Lukaku peppered Myhill's goal with shots as Belgium camped in the Welsh half. The sharpness of the visitors' passing eventually began to drop and Bale almost made them pay with a fiercely driven free-kick from 25 yards that needed a fine fingertips save from the otherwise untested Thibaut Courtois. But just as the home side began to raise hope of an unlikely equaliser, Vertonghen's thunderous strike settled matters eight minutes from time. Again Wales were unhappy with Swedish referee Stefan Johannesson as he gave a free-kick for a soft foul on Lukaku, and Vertonghen hammered past Myhill's despairing dive from 20 yards.